Abstract: In very recent years, the idea of computing with functions has been sparkled by the endeavor of the Chebfun system. Orthogonal polynomials enable functional operations and operators of all kinds to be numerically approximated with fast, accurate, and robust algorithms based on these approximations, giving people the feel of symbolic computing but with the lightning speed of numerical computation. The idea of computing with functions has also extended to the solutions of differential and integral equations. 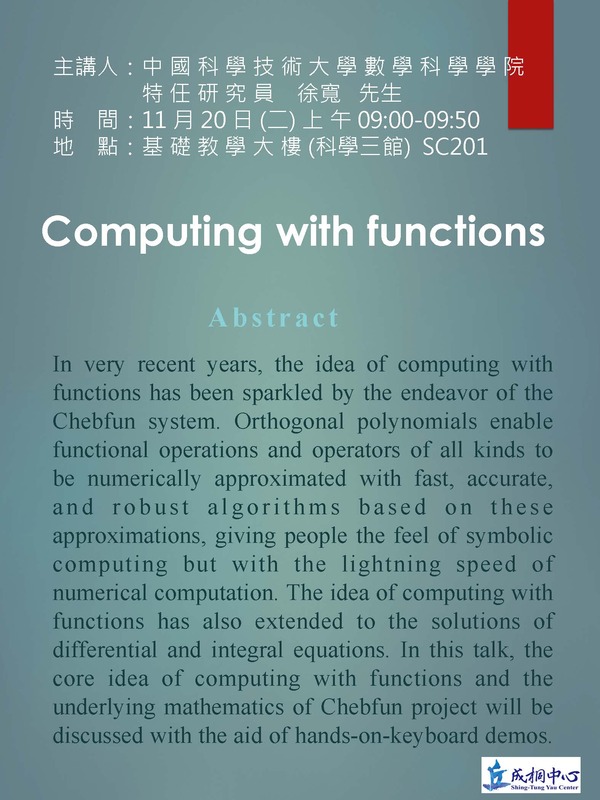 In this talk, the core idea of computing with functions and the underlying mathematics of Chebfun project will be discussed with the aid of hands-on-keyboard demos.